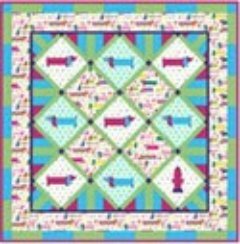 Free Dog Quilt Patterns for those quilters who love dogs. Quilts themed around dogs are always popular. In fact I appliquéd my grand daughter's dog on her pink quilt and also on the throw, both of which are showing on my home page. The patterns below have been supplied by the following major fabric manufacturers: Benartex, Henry Glass, Clothworks, Robert Kaufman Fabrics, Hoffman Fabrics and Windham Fabrics. Each free dog quilt pattern has been designed around a specific fabric range by one of the companies designers. 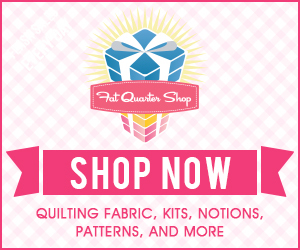 You may still find these fabrics in your local quilting shop or you may need to do a bit of substituting. Pattern courtesy of Benartex. 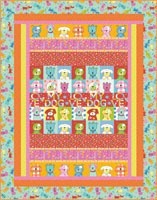 Puppy love Quilt Pattern. Pattern courtesy of Hoffman Fabrics. Dog Patch Quilt Pattern. Pattern courtesy of Henry Glass Fabrics. 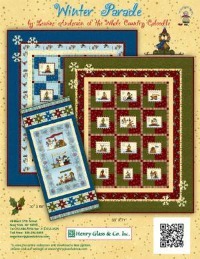 Winter Parade Quilt Pattern. Pattern Courtesy of Clothworks. 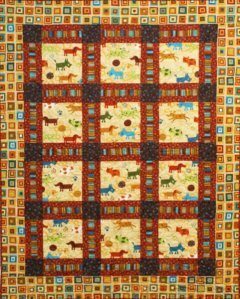 Dog Days Quilt Pattern. Pattern Courtesy of Robert Kaufman. 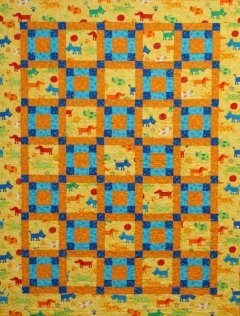 Dog Days Summer Quilt Pattern. Pattern Courtesy of Hoffman. Hot Dog Quilt Pattern. Pattern Courtesy of Hoffman. Scotties Star Quilt Pattern. Pattern Courtesy of Robert Kaufman. Bark Park Quilt Pattern. Pattern Courtesy of Windham. Le Chien Quilt Pattern. 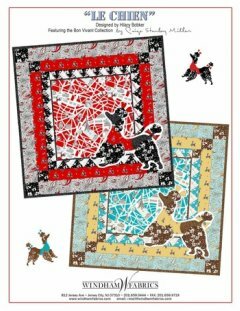 Most of the above free dog quilt patterns are pieced quilts that use fabrics printed with dogs. Some of the patterns also have some appliqué required. There are a range of appliqué techniques to choose from. My current favorite is raw edge appliqué. I have included brief instructions below outlining this technique. Another appliqué technique you may like to look at is the freezer paper method where all the raw edges are folded under. The best tutorial I have found for this is by Cori from Creativity Amongst Chaos. Step One: Stabilize your backing fabric with 'Spray Starch'. Spray a light application of spray starch onto backing fabric then iron dry. Repeat until backing fabric resembles very fine cardboard. Usually 2 to 3 applications. Step Two: Place appliqué pattern on a flat surface. Cover with Steam-a-Seam and trace outline. Step Three: Rough cut around traced pattern. Step Four: Peel off paper from one side of Steam-a-Seam and place on wrong-side of appliqué fabric. Iron in place. Step Five: Cut out on appliqué drawn lines. Step Six: Peel off paper and place cut appliqué onto background fabric. Iron in place. Step Seven: Sew around the edges using an open toed foot (this gives good visibility for your stitch placement). 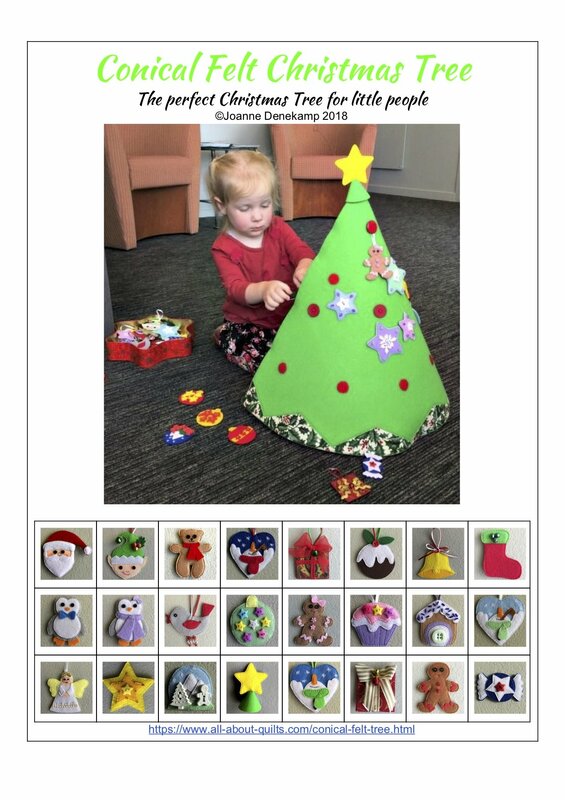 If you would like the above instructions with illustrations then visit Free Applique Quilt Patterns.